The TTRT-01 S3 is Amperis’ fourth generation, micro-processor based, single phase, and automatic transformer turns-ratio tester with line power only. The TTRT-01 S3 uses the IEEE C57.12.90 measuring method to determine the transformer turns-ratio. The transformer turns-ratio is determined by precisely measuring the voltages across the unloaded transformer windings. The TTRT-01 S3’s measuring circuitry self-adjusts before each measurement to ensure turns-ratio accuracy. Two selectable test voltages, 4Vac and 40Vac, offer flexibility in testing different types of transformers. The TTRT-01 S3 can measure transformer turns-ratios ranging from 0.8 to 15,000 and can be used to test voltage regulators, power transformers, current transformers (CT), and potential transformers (PT). The TTRT-01 S3 also measures and displays transformer- winding excitation current, winding polarity, and winding phase angle. Test results are displayed on a back-lit LCD screen (128 x 64 pixels) that is viewable in bright sunlight and low-light conditions. In addition to measuring a transformer’s turns-ratio, the transformer’s name plate voltages can also be entered, and the TTRT-01 S3 will then display the turns-ratio percentage error. 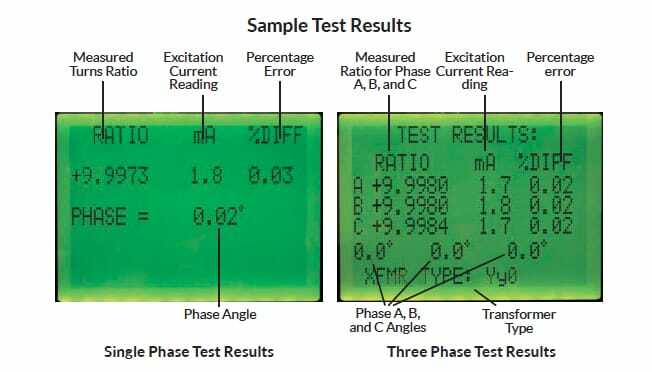 This convenient feature eliminates any user calculation errors when testing transformers. When testing a 3-phase transformer, the TTRT-01 S3 provides connection information (H and X test leads to the transformer bushings) for phase A, B and C tests. The TTRT-01 S3 features a back-lit LCD screen (128 x 64 pixels) that is viewable in direct sunlight and low-light levels. 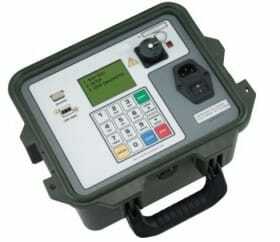 A rugged 16-key membrane keypad is used to enter test information and to operate the unit. The TTRT-01 S3 can store 128 records of 33 readings internally, and up to 999 test records on an external USB Flash drive. Test records can be recalled using the included Transformer Analysis PC software.